When you think about the Rainforest Alliance, do you conjure up visions of tree huggers standing in the path of a feller-buncher in the Amazon or the Congo? Well, your visions are about to get blown away. The Rainforest Alliance is not just for rainforests anymore. The Rainforest Alliance began in 1987 in response to fact that, at that time, 50 acres of rainforest were being destroyed per minute. Since then, the scope of the Rainforest Alliance’s mission has increased dramatically. Today, the Rainforest Alliance works to preserve biodiversity and address the effects of climate change across the globe. In addition to its work in sustainable forestry, the Rainforest Alliance works in diverse initiatives to accomplish its goals. Read on to learn about the amazing work being accomplished by the Rainforest Alliance on behalf of our planet. Sustainable Forestry: Sustainable forestry is the backbone upon which the Rainforest Alliance was founded, and it continues to be a vital part of their work. To that end, the Rainforest Alliance works with all types of organizations, from large corporations to small forest communities, to ensure that forestry is conducted responsibly, forest communities flourish in a sustainable manner, and ecosystems are protected. Supplier Certification: In 1993, the Rainforest Alliance helped to found the Forest Stewardship Council (FSC), an international non-profit that promotes responsible management of forests through its certification program. The Rainforest Alliance is the largest FSC-accredited certifier, and has over 20 years of experience in more than 50 countries and all forest types. Once wood products have been certified, they are marked with the FSC label as well as the Rainforest Alliance Certified™ seal. When wood purchasers see these marks, they can rest assured that rigorous standards have been met for protecting forestlands, communities, and wildlife. REDD+: The Rainforest Alliance actively works to support REDD+: Reducing Emissions from Deforestation and forest Degredation Plus forest conservation. REDD+, an initiative of the United Nations, seeks to mitigate climate change by enhancing forest management in developing countries. In Colombia, Ecuador, Ghana, Honduras, Mexico, and at the international level, the Rainforest Alliance supports REDD+ by providing training and technical assistance to foresters and forest communities. The Rainforest Alliance also works with governments to promote policies that incentivize forest protection and sustainable land management. Community Forestry: In many countries, forests are an untapped source for economic development in rural communities. The Rainforest Alliance works closely with many such communities around the world, helping them to harvest both timber and non-timber forest products using sustainable methods, while also helping them to build locally-owned enterprises that generate economic opportunities. With these undertakings, the Rainforest Alliance is ensuring that forest ecosystems are kept intact while improving local livelihoods. The atmosphere has no national borders and does not care where greenhouse gasses (GHGs) are emitted, so the most important factor in terms of fighting climate change is reducing the total volume of emissions worldwide. International attempts to mitigate the growth of GHGs in the atmosphere have resulted in the formation of a carbon market. Through the carbon market, businesses can compensate for the GHGs they emit through the purchase of carbon credits. A carbon credit (or carbon offset) is a financial unit of measurement that represents the removal of one ton of carbon dioxide equivalent (tCO2e) from the atmosphere. Carbon credits come from GHG emission reduction projects that replace the use of dirty fossil fuels with renewable energy, reduce the use of fossil fuels through energy efficiency, or capture and store already released carbon in trees and other plants. There are two carbon markets: the compliance market and the voluntary market. Compliance markets are created and regulated by mandatory national, regional or international carbon reduction regimes. Energy-intensive businesses such as power generators, oil refineries, iron and steel production and processing companies, those who produce commodities such as cement, glass and ceramics and the paper and pulp industry are generally part of the compliance carbon market. Other businesses, the government, NGOs, and even individuals can buy credits in the voluntary carbon market to offset their carbon footprint. In order for carbon markets to function, investors must trust that a project’s carbon-offset claims are reliable. To this end, the Rainforest Alliance offers training materials and tools for carbon project developers, and they assist with project implementation and carbon accounting. The Rainforest Alliance also evaluates the credibility of carbon project methodologies, and independently audits carbon projects to evaluate their carbon-credit claims. As of July 2014, RA has conducted validations and verifications of 60 carbon projects in 25 countries—from Mexico, Guatemala and Brazil to Mozambique, Kenya and Indonesia. The Rainforest Alliance also teaches forest communities how to increase carbon storage – through the restoration of degraded forestland, for example – and to measure the results of their efforts. These projects can earn money through the sale of carbon credits, providing valuable supplemental income for communities that depend on forests for their survival. In addition to these efforts, the Rainforest Alliance is active on technical advisory boards and steering committees for various carbon standards. Clearly, the Rainforest Alliance is a major player in the resolution of the global GHG emission crisis. Agricultural activity can be a driver of greenhouse gas emissions which cause climate change. To combat these issues, the Rainforest Alliance has developed a certification program for farmers which requires them to meet rigorous standards set by an international coalition of non-profits called the Sustainable Agriculture Network. The certification system is built on the three pillars of sustainability: environmental protection, social equity, and economic viability. Some farmers have taken additional measures to ensure that their farms increase carbon storage by planting trees, managing water use and improving soil conservation. Those who use the Rainforest Alliance’s climate-smart methods can help stabilize their microclimates, which in turn helps them adapt to prolonged drought and other impacts of global warming. Businesses play a key role in our collective ability to combat climate change. The Rainforest Alliance provides guidance and support for businesses in a number of ways. 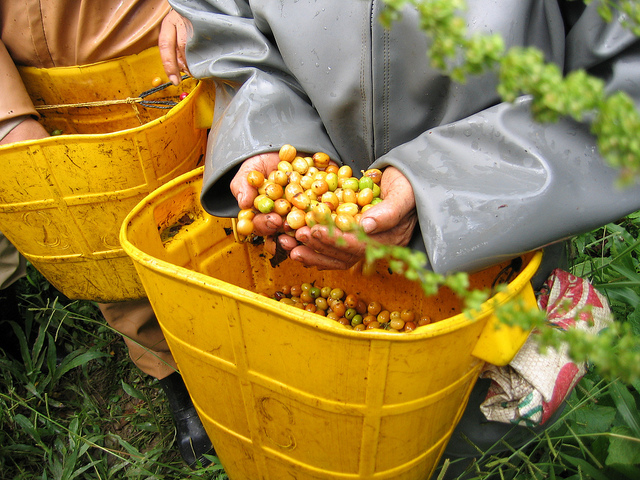 Sustainable sourcing: the Rainforest Alliance works with businesses to analyze their supply chains and ensure that their resources are responsibly sourced. The Rainforest Alliance can even help companies transition their sourcing policies to reach deforestation-free impact, while simultaneously helping the business to increase its productivity and resiliency. If a business that sources wood products wants to position itself as a leader in sustainable sourcing, the Rainforest Alliance offers SmartSource, a program that helps companies go beyond legal compliance and enables them to obtain market recognition for their long-term commitment to responsible sourcing. If a business requires resources from the farming industry, the Rainforest Alliance can strengthen the business’ supply chain by recommending connecting that business with Rainforest Alliance-certified suppliers. Sustainable tourism: Tourism is one of the world’s largest industries, and is a vital source of income for many developing countries. Unfortunately, this industry also contributes to pollution, deforestation, inefficient energy use and cultural exploitation. The Rainforest Alliance offers training to tourism businesses, providing them with the tools and techniques they need to run efficiently and sustainably. The Rainforest Alliance also offers an auditing process which results in certification and the right to use the Rainforest Alliance Verified mark on promotional materials. Carbon Offsetting: As previously discussed, businesses that do not directly manage natural resources can purchasing carbon credits to offset their GHGs. Many companies are choosing to do this as a matter of corporate social responsibility. The Rainforest Alliance can help these businesses select credible projects that have earned Rainforest Alliance verification for their emissions reductions. In addition to its fieldwork, the Rainforest Alliance works to shape climate policy at global, national and regional levels. The Rainforest Alliance provides governments with guidance and expertise, and encourages adoption of climate policies and programs to address forestry and GHG emission issues. Given all of the great work that the Rainforest Alliance accomplishes, how can individuals take action and support it in its initiatives? One of the best ways consumers can support green initiatives is to “vote with their dollars.” Supporting the Rainforest Alliance with your tax-deductible contributions is a great way to do this. Another way you can vote for green initiatives is through the purchase of products that bear the Rainforest Alliance’s little green frog seal of certification. It’s easy to do – just check out the Rainforest Alliance’s Shop the Frog page to learn where products with the Rainforest Alliance Certified seal are available near you. As a traveler, you can feel comfortable that you’re having a positive impact on the places you visit by checking out the Rainforest Alliance’s sustainable trip website before making your travel plans. And one more very important way that individuals can support the Rainforest Alliance’s initiatives is by helping to educate our youth about environmental responsibility and climate issues. The Rainforest Alliance provides teaching curricula on its website that presents information on forests, wildlife and local communities and provides a global perspective on the importance of protecting our natural resources. The curricula also gives students opportunities to take direct action. All of these resources can be viewed on screen or downloaded as a PDF, and are provided free of charge. The Rainforest Alliance even has an inexpensive iPad app, Rainforest Survival Challenge, which can help make learning fun. Talk to your school’s administrators about including this curricula as part of the schools programs, volunteer to guest-teach a few classes, or share the curricula with a community youth group. You just might inspire a child to become the next president of the Rainforest Alliance.